This guidance gives advice on asphyxiant gases used when welding metal fabrications and pipes, and in particular a technique known as purge damming, (containment of purging gasses in the area being worked on). It will be useful for employers and workers planning this type of work, and for inspectors assessing whether the controls in place are adequate to control the risks to health and safety. The consequences of exposure to an oxygen deficient atmosphere can be fatal, yet with reasonably practicable controls, as explained below, the risk can be reduced to an acceptable level. Accident history indicates that multiple workers are often affected. This is mainly as a result of the rescuer attempting a rescue, but getting into difficulties themselves due to the reduced oxygen levels. Workers have died or lost consciousness after entering fabrications where air has been displaced by gas shielded arc welding processes, or where inert gas has been used to fill all or part of a fabrication to enhance weld quality. This document describes the processes and associated hazards and gives advice on precautions to ensure the safety of all persons who may be affected. the effectiveness of weld shielding. The most common use of inert gas in welding is during gas shielded electric arc welding eg MAG, MIG and TIG. The inert gas is delivered directly from the welding torch automatically. It creates a temporary protective atmosphere around the arc and molten weld pool, excluding air and preventing the oxygen in the air adversely reacting with the weld. 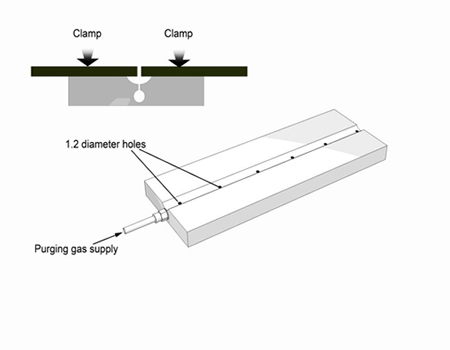 Inert gas delivered directly from the welding torch is generally sufficient to create a temporary protective atmosphere, however the inert gas may not pass though the unwelded joint in sufficient quantity to exclude air from the back of a weld joint. Excluding air from the back of a welded joint is particularly important when the corrosion resistance of the welded joint is important or oxidation defects are not acceptable. This is often the case when welding corrosion resistant metals such as stainless steel and ‘kunifer’ (copper/ nickel/ iron alloys) and when removing defects out of the back of a weld joint is undesirable or impractical. In these circumstances inert gas may be used to purge air from the back of the joint during welding operations. For smaller jobs the welder may purge air from behind the weld using the same gas supply as for the welding gun. This may be a proprietary mix such as argon/ helium or argon/ helium/ CO2. Mixed gases tend to be significantly more expensive than pure argon, as a result larger scale purging operations tend to use argon. Although metal active gas (MAG) welding does not use a true inert gas (often carbon dioxide or a mixture of gases) the gases used do not contain sufficient oxygen to sustain life. Similarly nitrogen is not a true inert gas as it can chemically react with metal at welding temperatures. However it is cheap so may be used to purge air, particularly if large quantities of gas are needed to purge a large void. Whilst acetylene and propane have distinctive smells, the other gases are odourless and their direct measurement difficult. All are colourless. Detection tubes are available for some, and the flammable gases can be detected with suitably calibrated flammable gas-detection equipment. The most appropriate detection method when checking oxygen levels is the use of a suitably calibrated oxygen meter. Gases denser than air can collect in tank bottoms, vessels, pits and other low-lying areas. In very still air conditions the denser gases, eg argon, can act almost like a liquid and will form dense, low-lying layers which will disperse only slowly. Lighter gases may collect in high-level spaces which could pose a risk if this is at head level. Although dense gases will tend to sink, and light gases rise, the movement is easily disrupted. For example a pressurised gas leak or intentional release of a jet of gas will entrain the surrounding air and may form a homogenous mixture or concentration ‘gradient’ within a confined space. Similarly the movement of people, plant or convection currents can cause sufficient air turbulence to disrupt the natural tendency of a particular gas to rise or sink. While the density of the gas used is important when considering possible hazardous areas, safe systems of work should not rely on the asphyxiant gas sinking or rising. Inhaling an atmosphere containing no oxygen causes loss of consciousness in a matter of seconds because such an atmosphere not only fails to provide fresh oxygen, but also removes that already present in the bloodstream. At the same time, carbon dioxide is removed from the blood disrupting the normal ‘breathe’ reflex. There will be little sense of breathlessness to warn the victim that something is amiss, and they will rapidly lose consciousness. The heart will continue to function for a short time, but will then arrest, causing circulatory failure. When the gas used contains some oxygen, the loss of this from the bloodstream takes place more slowly. Victims may suddenly feel very fatigued and often become confused and irrational. If normal concentrations of oxygen are restored at this stage the victim will usually recover. However, prolonged exposure to such an atmosphere will result in loss of consciousness and then death. Many people are unaware of the speed at which unconsciousness can occur and incorrectly believe that it would be possible to rescue themselves in such circumstances. The following circumstances may result in the unintentional build-up of asphyxiant gases in confined spaces. During MIG, MAG or TIG welding on the outside of fabrications, torch shielding gas can enter the fabrication through the weld root. Torch shielding gas can rapidly accumulate inside a fabrication during internal MIG, MAG or TIG welding. Purging and/or shielding gases leaking or being discharged after use can accumulate in other sections of a fabrication, plant or into a nearby room, cellar, sump, or pit. This is not an exhaustive list of the processes which may give rise to accumulations of asphyxiants. This procedure uses rigid dams or inflatable bladders inserted in to a fabrication or pipe to seal off a section. Inert gas is introduced between them displacing or diluting the air trapped between the dams. The aim is to prevent oxidation of the weld metal and maintain the corrosion resistance of the pipe or fabrication. Purge gas damming is commonly used by engineering and fabrication companies who manufacture plant for the petrochemical, offshore and nuclear industries. It is often carried out on site to make closing welds during final assembly. 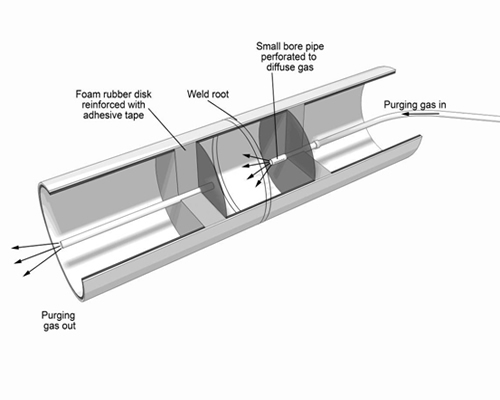 Proprietary purge gas dams and bladders for pipe welding are widely available and relatively cost effective. Although there is nothing prohibiting the use of a home-made dam (eg illustration A), proprietary systems are often designed with certain safety features that may not be present in home made dams. excess gas can be bled off from the dams by a system of hoses and discharged outside the fabrication. Dams and bladders that feature pull-cords can reduce or eliminate the need to enter the pipe or fabrication in order to reposition the dam at successive joints along a length of pipe. Rigid dams may have flexible seals to reduce the escape of purging gas. Inflatable bladders form a ‘seal’ when inflated (provided the bladder is appropriate to the size of pipe or fabrication). Proprietary dams and bladders will often form a better seal reducing the likelihood of an uncontrolled release of gas. 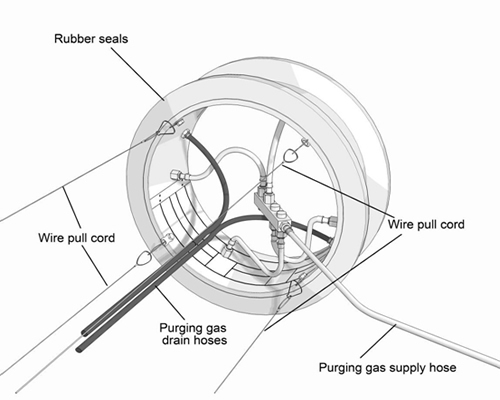 Note however, the seal on both dams and bladders should not be relied on to prevent gas leakage. Therefore, the pipe or fabrication may still become a confined space (as defined in the Confined Spaces Regulations 1997) and appropriate precautions should be used if entry into the space is required. If the work is in a confined space or will create a confined space, then the priority when carrying out a risk assessment is to identify measures needed so that work in confined spaces can be avoided. If it is then not reasonably practicable to avoid entry, the risk assessment will help to identify the precautions required in a safe system of work. There will be occasions where purging air from internal spaces is necessary and it is safer to seal all openings and intentionally flood the entire internal volume of a vessel, pipe etc. As the amount of gas used is likely to be relatively high the employer or welder should consider the risk of accidental release of gas during the operation (eg rupture of a seal) and how to intentionally discharge/disperse the gas once the operation is concluded. The quantity of gas released can be significantly less when using localised purging techniques. This means damming and use of backing plates (illustration C) could offer safety benefits over flooding an entire vessel. Note that manually holding a backing plate or ‘shoe’ to the back of a weld during a welding operation, and moving it along as the weld progresses, is a particularly dangerous practice if the person is in a enclosed or confined space. Glove boxes and glove bags (transparent plastic bags fitted with integral gauntlets) are available and can be used to enclose the work piece completely. They can be quite large and contain several cubic metres of gas. Again the consequences of an accidental gas release and a safe way to discharge and disperse the gas should be considered. Workers may need to enter a fabrication, eg to inspect the weld root, to retrieve equipment used in the work process or to carry out further work once the welding process has been completed. They may also enter hazardous locations under less foreseeable circumstances, eg when they have fallen in. Accidents have even occurred when employees have placed only their head and shoulders into a confined space. Entry and/or work in a confined space should only be considered when no alternative is available. If asphyxiant gases must be used, then production and inspection methods should be adopted which avoid the need for entry into the spaces into which these gases have been introduced. For example, insert the dams before the 2 parts of the fabrication are aligned and tack welded together. Some dams can be positioned and removed remotely through the use of pull-cords or, in circumstances when they become jammed, through the use of drain rods. Where successive joints have to be welded, pull-cords attached to either side of the dam can be used to position it at each weld in turn. Consider whether final inspections can be carried out using long-handled mirrors or fibre-optic video cameras. inert gas shoes or backing bars are held in place by means other than someone in the space and adequate precautions have been taken to prevent the accumulation of inert gas. If entry into a confined space is unavoidable then a safe system of work must be followed. The first step in the development of a safe method of working in confined spaces is a risk assessment. General guidance on risk assessment is given in the Confined Spaces Regulations, Approved Code of Practice (ACOP), L101. An important part of a safe system of work is to ensure that where an inert gas has been used in a confined space, the space should be vented, purged and tested for oxygen concentration to ensure the atmosphere is safe to breathe before any person enters. Testing should be done using appropriate meters and without entry into the confined space. Even placing just the head inside the confined space should not be attempted. The test should encompass the entire volume especially the deepest areas where a dense gas may be present. There are substantial risks if the oxygen concentration in the atmosphere varies significantly from normal (ie 20.8%). Movement of air in the confined space work environment should be ensured by suitable means of ventilation which may be forced or artificially assisted. The atmosphere should never be 'sweetened' using oxygen supplies as oxygen enrichment considerably increases the risk of fire. Work involving the use of asphyxiant welding gases whilst persons are in a confined space should be avoided. If such work is essential, effective arrangements will be required to prevent accumulation of the asphyxiant gas and suitable respiratory protective equipment (RPE) will be required. In these circumstances, the RPE should use an independent air supply, ie fresh air hose, compressed air line or self-contained breathing apparatus. Safe working in a confined space must be planned carefully and the guidance in the above ACOP should be referred to, with due regard to issues raised by the welding process outlined above. Before any person enters a confined space of any type, arrangements for rescue in the event of an emergency should be in place. The arrangements required will depend upon the findings of the risk assessment and on the nature of the likely emergency. There should be measures to enable the alarm to be raised in the event of an emergency. Normally entry into a confined space should only be permitted if there is at least one other person in attendance (either inside or outside the space). This person should be trained and equipped to initiate emergency rescue procedures. Appropriate rescue equipment, which may include suitable breathing apparatus, belts/harnesses, lines and hoists should be provided. Emergency arrangements should not rely on the attendance of the Fire and Rescue Services or other remotely located rescue team.